Liverpool XI: Mignolet, Clyne, Sakho, Lovren, Moreno, Henderson, Can, Lallana, Firmino, Coutinho, Origi. Leicester XI: Schmeichel, Simpson, Morgan, Huth, Fuchs, Mahrez, King, Kante, Albrighton, Okazaki, Vardy. Anyway it does not matter as the final whistle goes seconds later. All over at Anfield! Go here for all the reaction. See you later! This could be a match-saving block! Emre Can sticks a boot in the way as Andy King tries to turn in from close range. Leicester pack the box for a long throw, but the home side escape! A few gaps are appearing in the Leicester defence as Liverpool threaten to grab a second. Liverpool almost seal the win! Philippe Coutinho strikes from distance, the ball dipping and swerving, before landing on the roof of the Foxes net. Claudio Ranieri rolls the tactical dice for a final time....and comes up with a number 19. That's £9m man Andrej Kramaric who hasn't made much impact since arriving in January. Adam Lallana tumbles in the Leicester box under a robust challenge from N'Golo Kanté. But the Leicester man gets the ball and ref Martin Atkinson waves a pleading Lallana up to his feet. Leicester almost nab a leveller! Liverpool have keeper Simon Mignolet to thank for still being ahead, the Belgian reacting quickly to push away Foxes substitute Nathan Dyer's sweeping close-range effort. Leicester manager Claudio Ranieri is ringing the changes. Off comes *gasp* Jamie Vardy. Off comes Shinji Okazaki. On come Leonardo Ulloa and Nathan Dyer as the Italian tinkers his attacking options. After probing mostly down the right flank, Liverpool's goal ended up coming from down the left! You can see how Roberto Firmino (11) picked out Christian Benteke (9) to finish. Right then, it's time for Leicester to answer that question that everyone has been asking - what are they made of when the going gets tough? No instant response. Well, apart from Wes Morgan kicking a lump out of a Liverpool opponent. "Leicester have scored in every game this season, could the run come to an end today? It was a good goal from Christian Benteke, who stretched to finish it for Liverpool." What a response! Moments after being discarded as a lost hope by Reds fan Chris Wright (see below), Christian Benteke responds with the opening goal! The Belgium striker, who is only on the pitch as a substitute because of Divock Origi's first-half injury, stretches out his right boot to stroke in Roberto Firmino's pull-back. Quality pick out by the Brazilian. Liverpool are targeting the Leicester left flank - shown below in our graphic - as they continue probing for the opener. Jordan Henderson finds space to whip the ball into Christian Benteke, but he cannot keep down his 10-yard header. Liverpool are still huffing and puffing. Sharp movement from Roberto Firmino as he peels off in the right channel to pick up Nathaniel Clyne's pass and drill towards the six-yard box. But Foxes skipper Wes Morgan - not for the first time - scurries across to block. I know a man who would have loved to be racing on to that Jordan Henderson pass (see the previous entry) - Daniel Sturridge. Unfortunately we have just the perennially-injured Liverpool striker sat in the Anfield stands sipping on a warm cuppa. Hollywood stuff from Jordan Henderson! The Liverpool skipper wins possession, takes a touch, looks up, then pings a 50-yard diag to Christian Benteke. But the burly Belgian can't accelerate away from the away defence, unable to pick out a red shirt when he goes back inside. Ouch! Jamie Vardy crumbles to the ground, clutching the back of his right calf after being raked by Emre Can. The Liverpool midfielder pleads his innocence, but referee Martin Atkinson isn't buying it. Booked. The Kop raises the volume as Liverpool win their first corner in front of those supporters. But it is a disappointing delivery from Philippe Coutinho, who can't beat the first Leicester man. Oh dear! Liverpool centre-back Mamadou Sakho has bit of a meltdown as Leicester put him under pressure in his own half. Shinji Okazaki breathes down the back of the Frenchman's neck as he scuffs a backpass to centre-back partner Dejan Lovren. Then Sakho can only find a blue shirt when receives the ball back from Simon Mignolet. Fortunately, for him, Leicester can't punish the home side. Early half-chance for Leicester within seconds of the kick-off. A high ball drops to Jamie Vardy, who tries to smash a rasping volley towards the top corner. However, the Leicester striker mis-hits the ball and it spins easily into Simon Mignolet's gloves. Jurgen Klopp is the first face of footballing repute to reemerge from the Anfield tunnel. The Liverpool boss is afforded a generous round of applause as his skipper Jordan Henderson points and gestures to the areas where he wants Christian Benteke to run when the action restarts. In contrast, Leicester have barely had a sniff of goal so far. Three shots, only one on target. And one horror from Shinji Okazaki - which I didn't spot during the first half - that almost cleaned out the corner flag. Liverpool had plenty of efforts at the Leicester goal - 15 to be precise. However, only two have hit the target (as shown by the two green arrows in the graphic below). Plenty of endeavour from Liverpool but, I suppose, a lack of quality in the final third. Reds fans should remain positive though that a goal could come if their team remains positive. Leicester too will be pretty happy. The Foxes, despite offering little attacking threat, have been organised and resolute defensively. Which way will it go after the break? Hard to tell. So don't go anywhere! Two minutes of injury time, we are reliably informed by the fourth official. Adam Lallana receives the game's first yellow card for not retreating at a Leicester free-kick. Silly. Liverpool go left as they lump the ball towards Christian Benteke - and he is unceremoniously shoved to the the turf by Wes Morgan. Free-kick. But it is wasted by Philippe Coutinho, who only finds the top of the Leicester wall from the left flank. Leicester almost nick the opener! Liverpool's defence fails to clear properly when Marc Albrighton clips in from the left flank. The ball falls to Riyad Mahrez, who slaloms through the home players before fizzing a rising shot from 20 yards. Simon Mignolet is equal to it though, acrobatically pushing over his own bar. All a bit quiet since that change. Christian Benteke has hardly had a sniff yet. Yep, Divock Origi cannot continue. And that's a shame because he has looked lively. On comes Christian Benteke in his place. Oh dear. Divok Origi's afternoon looks to be over as he sits disconsolate on the Anfield turf. Appears to be a hamstring injury. Showboat! Philippe Coutinho cheekily backheels into the path of Emre Can, whose shot from 25 yards loops off an away defender and into the hands of Kasper Schmeichel. So far so good from Liverpool. Apart from not bagging, of course. The Reds are staying patient, trying to pull apart the away defence. Leicester fans will be reasonably happy too though, their side has stayed resolute without offering much on the break. Liverpool are winning 5-0 in the shots-at-goal scoreline. Dejan Lovren is the latest to have a pop, escaping his marker to meet Jordan Henderson's free-kick with a stooping header. But he cannot generate enough power - or direction - to trouble Kasper Schmeichel. I've barely mentioned Jamie Vardy - until now. The industrious Marc Albrighton does well down the left flank, winning the ball before flicking towards the England striker. But he can't jump high enough to stick his forehead on the ball. That's as much as Leicester have threatened since the opening stages. Divock Origi is pumped! The Liverpool forward looks the likeliest to break the deadlock, again going close. Well, I say close...he lashes well over the bar after wriggling into space in the right channel of the Foxes box. Divock Origi is asking questions of the Leicester defence with his pace and movement. The Liverpool striker peels off to the left, picks up Philippe Coutinho's pass and shoots low at the near post. However, Foxes keeper Kasper Schmeichel is there to block. Emre Can is not known for his goalscoring prowess - but the Liverpool midfielder almost grabs only his second Premier League goal. The German tries his luck from 20 yards but he cannot beat Kasper Schmeichel at his near post. All gone a bit scrappy. Liverpool still probing without much joy. Leicester struggling to find momentum. Is it in? Is it wide? Half of Anfield is unsure as Adam Lallana fizzes a shot goalwards from a tight angle. It isn't in. The Liverpool midfielder hits the side-netting, with ball clinging onto the back of the net to fool those squinting across from the Kop. Leicester make a half-hearted penalty appeal as Shinji Okazaki tumbles under the attention of Reds defender Mamadou Sahko. Seen them given - but it would have been soft. Moments later, Liverpool spring forward and Philippe Coutinho wildly slashes over the Leicester bar with his second shot of the afternoon. "Liverpool are dominating so far, but without really hurting Leicester, and we all know how incisive Claudio Ranieir's side can be on the counter attack." Divock Origi has been given the nod up front for Liverpool, with fellow Belgian Christian Benteke sat twiddling his thumbs on the bench. Origi offers more movement than Benetek, showing his sharpness again with another positive run. But Coutinho's pass is too strong and Kasper Schemichel collects. Anfield has found its voice. The home side have the win - and it is blustery in Liverpool - in their sails. Plenty of pressure from the Reds - can they make it count? Excellent pressure from Liverpool around the away penalty area. Divock Origi is almost sent scampering clear, but Wes Morgan gets across to block. Corner. Foxes keeper Kasper Schmeichel flaps at the set-piece but there isn't a red shirt there to poke in. Liverpool are enjoying most of the possession in the past few moments. Patient play from the hosts as they try to pick a hole in the away defence. Leicester, as you would expect, are happy to sit back and pounce on the counter. Liverpool being asked to play in front of the well-drilled Foxes. No forward incision yet. The Reds win a free-kick inside their own half when Marc Albrighton clunks the shins of Nathaniel Clyne. Riyad Mahrez, however, hasn't won the plaudits for his defensive play - it is attacking attributes which have wowed the country. Here's why. A quick free-kick sets the Algerian away down the right, dancing past Philippe Coutinho and Alberto Moreno before drilling a low cross towards the near post. Mamadou Sakho hacks clear. Liverpool have the first effort on goal. Alberto Moreno scampers down the left, laying off to Philippe Coutinho. Any danger? Doesn't look to be, until Coutinho accelerates inside Riyad Mahrez and dangerously curls past the far post. I'd love to tell you that it has been a high-octane, helter skelter start. But it hasn't. Leicester defender Christian Fuchs sloppily gives away possession but atones for that error to win back the ball for the visitors. "I watched Liverpool's 3-0 defeat by Watford and I saw that Odion Ighalo and Troy Deeney had more desire than Jurgen Klopp's players. "Watford beat them up physically, and in the way they went about the game - their mentality - too. That will be have been a real disappointment for Klopp. I expected better things from him." Jurgen Klopp and Claudio Ranieri enjoy a warm embrace on the touchline, whispering a few words into each other's ear. The Kop gives itself a round applause for a particularly ear-splitting, vigorous scarf-waving rendition of Gerry and the Pacemakers. Liverpool: Mignolet, Clyne, Sakho, Lovren, Moreno, Henderson, Can, Lallana, Firmino, Coutinho, Origi. Subs: Toure, Benteke, Lucas, Allen, Bogdan, Teixeira, Randall. Leicester: Schmeichel, Simpson, Morgan, Huth, Fuchs, Mahrez, King, Kante, Albrighton, Okazaki, Vardy. Subs: De Laet, Kramaric, Ulloa, Dyer, Wasilewski, Schwarzer, Inler. "We're top of the league, we're top of the leaguuuue, we're Leicester City, we're top of the league!!" chant the away fans. Indeed you are. Liverpool manager Jurgen Klopp on Leicester's success: "I am not surprised any more, no one is surprised any more. They have quality and it is deserved. Leicester don't need many chances to score. We have to avoid starts like we had too often this season. I would like to defend a 1-0 and not always strike back from 0-1. We need to be concentrated from the first second." The packed away end is, unsurprisingly, making some racket from the Anfield Road stand. Each name on the away teamsheet is greeted with a huge roar when it is read out. It is 'man versus machine' this week. Our man Mark Lawrenson takes on a state-of-the-art super-computer called SAM (Sports Analytics Machine) in his weekly prediction game - find out here what they have plumped for. Leicester are leading the pack in the Premier League - and they are doing the same in our Predictor league table. Liverpool fans, like their side, are scrapping around in mid-table. You can help maintain/improve your team's form by having your say in our Predictor game. Claudio Ranieri has revealed Liverpool boss Jurgen Klopp helped him recover from his sacking by Greece. The Leicester boss visited Klopp's ex-club Borussia Dortmund at a training camp earlier this year following his sacking from the Greece national team last November. "They were in La Manga in Spain, I went there," said Ranieri. "I had my Greece player there (Sokratis Papastathopoulos) I called him and asked if Klopp would agree. "I watched Pep Guardiola, I watched Bayer Leverkusen last winter, I was in Germany three times. "I have a lot of spirit for this, for this reason, it's a great experience, I want to see and I want to learn." So let's attempt to answer Steve Bower's question - how far can Leicester go? Apologies for the lack of creativity around our discussion topic, but that is what we're all talking about. But don't feel left out Liverpool fans! Tell me how you think your team will fare over the rest of the season. In 140 characters tell me where both sides will finish in May - I'll start....Leicester 5th, Liverpool 6th. "If they can come out of the hectic festive schedule in positive fashion then the belief that it could reach fairytale proportions will only increase. "Fresh from a win across Stanley Park last weekend, they will fancy their chances of another three points on Merseyside. "This is an important game for Liverpool, who haven't won in their last three league matches. Their headline-grabbing performances under Jurgen Klopp so far have all come away and they need to improve at Anfield. "Their first challenge is to become the first team to stop Leicester scoring all season." "There are massive positives but some of Jurgen Klopp's ideas haven't transferred to performances on the pitch. It is not just the results, but the performances on the pitch too. "Leicester will sit deeper but no-one is better than them on the break. There is no fear when they go forward." Reds boss Jurgen Klopp is stood, as usual, arms folded close to the halfway line. The German surveys the scene as the Liverpool players go through their warm-up drills. The Anfield floodlights are already turned up to the max, dark skies hovering over Merseyside. Leicester make just the one change from the 3-2 win at Liverpool's neighbours Everton last weekend. German defender Robert Huth is back after suspension, replacing Marcin Wasilewski alongside skipper Wes Morgan. That means Jamie Vardy, the Premier League's top scorer with 15 goals, starts up front. The England man limped off with a hamstring injury but it was not "serious" according to Foxes boss Claudio Ranieri. Belgium goalkeeper Simon Mignolet returns from a hamstring injury as Jurgen Klopp makes three changes to the side which lost 3-0 at Watford. Centre-back Dejan Lovren is fit after a knee injury, replacing the injured Martin Skrtel. Striker Divock Origi starts as midfielder Lucas Leiva drops to the bench, where he will sit alongside Christian Benteke. Even the most optimistic of Leicester supporters could not have wished last Christmas for what they have received from their team this year. Come on, be honest - you didn't did you? Liverpool fans are desperate for a similar change in fortunes - is Jurgen Klopp the man to make it happen? Seismic swattings of Chelsea and Manchester City suggested so, but recent humblings against West Brom and Watford have dampened excitement levels. Last Christmas, Leicester supporters were miserably munching through their mince pies. Their team had lost 12 matches in a row and were rooted to the bottom of the Premier League. The Championship, seemingly, beckoned. This Christmas, Foxes fans are feeling the festive fun. Their team are TOP of the Premier League, two points clear of Arsenal. 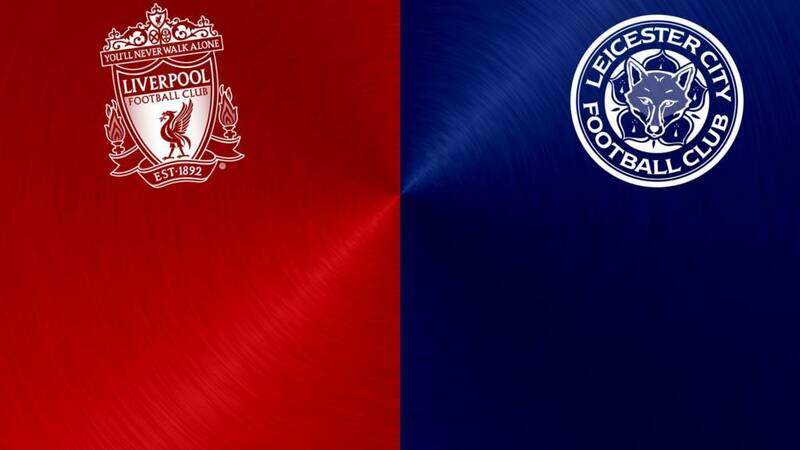 Welcome to our live page for Liverpool v Leicester City. We’ll have text commentary here from 14:30 GMT and there is also 5 live commentary from 15:00 GMT. You can keep up to date with all the build-up to today’s games here.